The expertise and experience of Paolo Favaretto blended with Nicola Zocca’s innovative ideas originated an elegant and exclusive desk system. Paolo Favaretto (1950) graduated in architecture from the University of Venice, in 1973, and immediately founded his own design practice: Favaretto & Partners. Nicola Zocca is a young and creative furniture designer. Zocca graduated from the Royal College of Art and became well known for his final year project: the ‘Shrink Series’ which included a chair, a bookshelf and a side table. Zocca’s innovative project was based on a simple but inventive process: the parts were assembled with heat shrinkable tube. 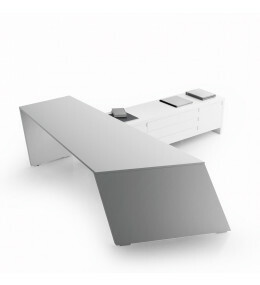 Origami Desk System is a executive workstation designed by Paolo Favaretto and Nicola Zocca.